Can you think of your life without the internet? Even thinking of it scares us, isn’t it? That’s what we are so much used to it. It is part of life, and we do internet surfing in office, home and on the go as well. The moment we take our smartphone off the pocket, we need the Internet on it. It became a fundamental requirement for all, and I am too one of them. Most of the time we are on the go and our ISP (Internet Service Provider) not able to provide a proper signal(Internet) there. It happens right? And that makes us feel very annoyed and frustrated, and even it makes us crazier when we see a WiFi router available at the same place as well, but for using it we cannot access it. As everyone doesn’t let the access of WiFi to everyone and we too feel a little shy to ask for a password, but we want to connect to WiFi without a password. Don’t get upset at all, a small trick can solve this problem, and we can access the internet without a password. Thinking how that can be done..???. Yes, I said it right, we can access the Internet from WiFi Router without the password. As said above a simple trick will work out, and you don’t even have to ask for the password as well. So here, all we need to do it is we need to switch on a button from the WiFi Router from the back side of it. The Button is called “WPS button,” which can be accessed easily just with a push. Please find the image below for better insights. Here I showed this from TP- Link router. So for confirming whether you have performed the action correctly or not, we can see an extra light blinking on the router with a lock symbol in it. If it blinks, then we are on the right path to access the Internet from a WiFi router without the password. Here I am using a Lenovo Phone to perform the next actions. Step 1. Go To Settings – WLAN (You will be able to find few networks) as shown in the below image. Step 2. Now tap on the three dots (options), and few more will pop up as shown in the picture below. Step 3. Now tap on Advanced. Step 6. 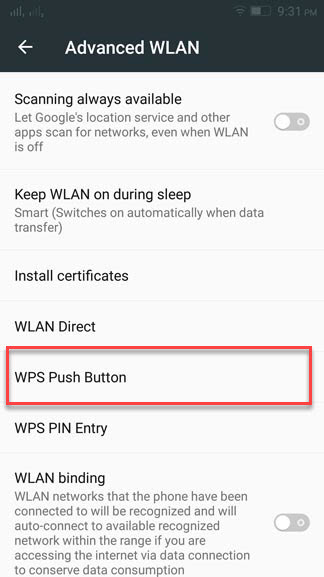 Once Tapped on the WPS Button it will be start connected to the router, this will take a few seconds, and we will be able to access the internet without any password. Happy Surfing! Anywhere you want to.